NASA's new white B-52H, destined to join a veteran B-52B mother ship at NASA's Dryden Flight Research Center. B-52H over Dryden Flight Research Center. 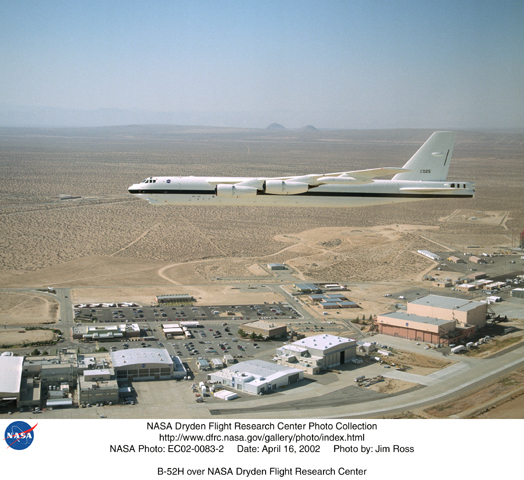 NASA obtained a B-52H bomber from the U.S. Air Force in 2001, intending to use the aircraft as an air-launch and testbed aircraft to support NASA, Air Force and industry flight research and advanced technology demonstration efforts at NASA's Dryden Flight Research Center, Edwards AFB, Calif. The B-52H replaced Dryden's famous B-52B "008" following that aircraft's retirement on Dec. 17, 2004. However, with no research projects requiring its capabilities on the horizon under NASA's restructured aeronautics research programs, the decision was made to return the aircraft to the Air Force.